Today is a particularly great day because we’re announcing our very first pregnancy here on Nesting Nelsons. Many of you are regular readers and many of you are new readers, but both camps will notice that the content on the site will be changing to keep up with medical updates, symptoms, funny stories, “quirks and quarks” and general home-life geekery in our house as it undergoes the massive change of first-time parenthood. We’re in for some ups, downs, twists, turns and a whole lot of fun. We cannot wait to meet Baby Nelson #1 and to see what all he or she has in store for us. We have the added challenge of having family and friends across at least 3 different countries – in Canada, Germany and the US – but hope that we can make everyone feel involved on our blog. If you have Facebook and haven’t added the Nesting Nelsons Facebook page, James and I encourage you to do so! It will give you updates on when we’ve added a new blog entry on here. As global citizens, with broader horizons than ever, we are fortunate to live in the age of the Internet. In my posts, there will likely be a lot of medical information. I have learned very quickly that pregnancy can be one giant science experiment and things rapidly change as far as routine procedures done now compared to 5-10 years ago. I’ll try my best to explain them and if you ever feel like I’m sharing more than you want or need to know, just skip ahead to the next section. 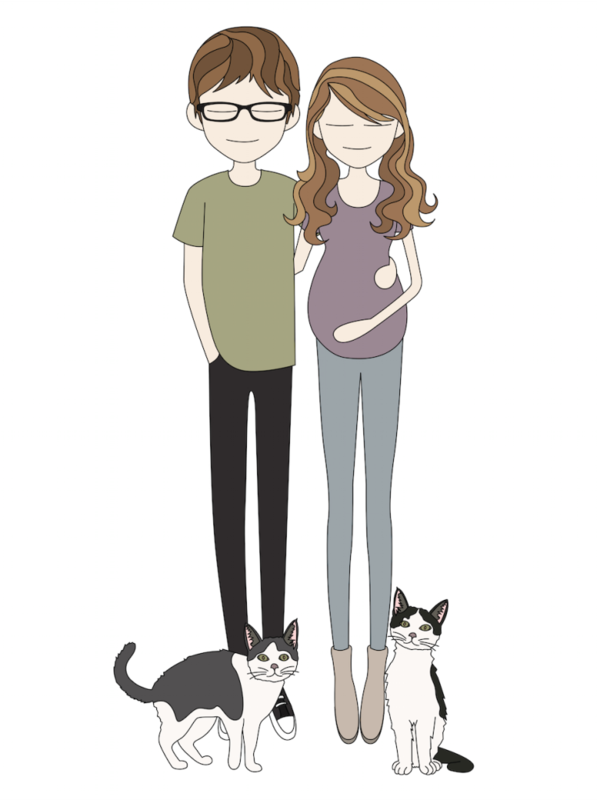 So, now that the introduction is out of the way, I’m sure most of you would like to know some details on baby and pregnancy! Our family portrait announcement, complete with Scout and Boogie! For readers and friends from the TTC (trying to conceive) community who are curious around the details of conception, my LMP was December 8th-15th, but I’m very sure that I ovulated late. I’m not entirely sure when, but for the entire predicted week of ovulation, I turned up negative OPKs and, sadly, ran out of OPKs before I could catch my conception window. My initial guess, prior to the ultrasound, would have been Christmas Day, placing our due date right around the time we received, give or take two days. For fans of the Shettles method of conception, we have a good chance at having conceived either a boy and a girl; It just depends on whether we had some fast swimmers who made it to the top on the same day or whether we had some resilient swimmers who hung around a few days waiting to greet the egg when it was released. If this aside is Greek to you, do not worry. Before I became pregnant, I was a part of the TTC community for several months and developed a lot of great friendships through the bond of starting our individual families. For the pregnancy aspect, I have had morning sickness (nausea-only). I have had a very big change in appetite, in that I feel as thought my entire day is based around food now and when the next time I am able to eat is. I cook often but the smells of cooking or food in general give me severe feelings of sickness at times and I have to take a break. I haven’t had any specific cravings aside from needing at least one very big meal per day that is mostly protein-based. At times, I’ve wanted some specific things like coconut shrimp, a #7 from Jersey Mikes (a sub sandwich with turkey – *heated*- and provolone, “Mike’s Way” without the tomato and salt and extra vinegar) and homemade tacos. Every once in a while, I’ll get the inklings of wanting a small milkshake, but I haven’t caved in quite yet. As far as sweets go, I dive into a few pieces of dark chocolate here and there since Valentine’s Day is right around the corner. No cravings for carbohydrates or sweets; Mostly just meat and Mexican food. I take a greta prenatal with actual folate (instead of folic acid) inside of it in order to make up for any vitamins or minerals I may not be getting through my diet. At the beginning of pregnancy, I was participating in Barre3 class up to 3x/week and was doing very well with it. However, on my very last class, I became violently ill mid-class and haven’t really had the energy to return since. I’m hoping for the fatigue aspect to subside in the 2nd trimester so I can wake my muscles back up and to have more productive days. Much of first trimester has been marked by “brain fog”, which has been particularly challenging as I’m taking a class to learn my very first programming language, “R”. In short, “R” is primarily a data science language used for those who like to analyze very big data sets (used in the medical field or nationwide statistics). Hopefully, baby will absorb a little bit of information as I learn it! 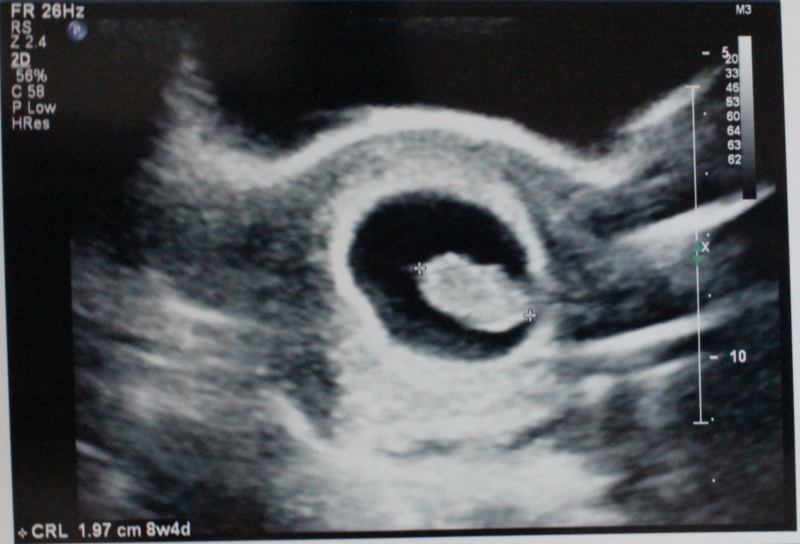 So far, we have had our very first doctor’s appointment (Feb 5th) and our first “dating” ultrasound (Feb 11). At the first doctor’s appointment, we talked about family history, symptoms and what tests we would like to opt into or opt out of. We also tried to find the heartbeat on the doppler, but baby was hiding a bit so we didn’t hear it at our first appointment. The CNM (certified nurse midwife) we saw said this was no cause for concern and that it may be a little early. There were a lot of choices of which blood tests to run, but we went through each one and decided to opt into everything preventative and informative that were very low risk to baby. After seeing the CNM, James and I grabbed lunch and I had several blood draws in the downstairs lab. Some of these were typical (RH factor, CBC or “complete blood count”, Hepatitis B screen, Rubella antigen screen) and some of these were extra (testing for diabetes risk and thyroid risk). I decided to request these latter two tests because I have an immediate family history of both. The nurse called with my results over the weekend with a great report of having normal ranges for all things on my CBC, glucose tests, Hep B, Ruebella immunity. She commented that it was rare to have someone to have a perfect CBC test (to be inside of normal ranges for all of the things on the panel) which meant that I was in excellent health. At every doctor’s appointment, weight and blood pressure are measured. I began my pregnancy at 123lbs, and at the first appointment, I had gained 2.5lbs so far of my total pregnancy weight. However, I did find out that my thyroid is considered a “hypothyroid” at this time. A “hypothyroid” is a thyroid that does not make enough T4 hormone (called thyroxine). In hypothyroidism, this can be remedied by taking a supplemental amount of thyroxine in order to make up for what your body is missing. It is difficult to say whether this was an issue prior to pregnancy or if pregnancy pushed my thyroid into the “hypothyroid” range. However, this hormone from the thyroid is very important for baby’s growth and development. If you are curious about hypothyroidism, here is a link to a little bit of information about it. So, now I have started my new supplemental hormone prescription and will be doing routine blood draws, every 4 weeks, to test my T4 levels to make sure that baby is getting what he or she needs. The thyroid medication itself has a few rules around it, including: taking it at the same time every morning, taking it on an empty stomach, waiting an hour after taking it to eat, drinking a full glass of water with it and a 4-hour wait to take my prenatals after taking the medication. So, this required a little adjustment at first, but its all a part of a normal day now. “Waterbear” & The First Big Screen Debut! Not long after adjusting onto the new medication, we were able to see our little waterbear on the big screen. A quick aside on the nickname “Waterbear”: A “waterbear” is a nickname for a microscopic creature with a scientific name of a tardigrade. The tiny animals can withstand tremendous pressure, can be cryogenically frozen and brought back to life. They even thrive in a vacuum. Where other animals would perish, tardigrades survive! They are incredibly tough and incredibly resilient. If you’d like to learn more about the animal we nicknamed our little babe afterwards, here is the link to the wikipedia page. James even went so far as to order a little stuffie for our new addition once her/she comes home. Waterbear stuffie link found here. Hi mom and dad! A close-up of Waterbear doing a little wiggle. 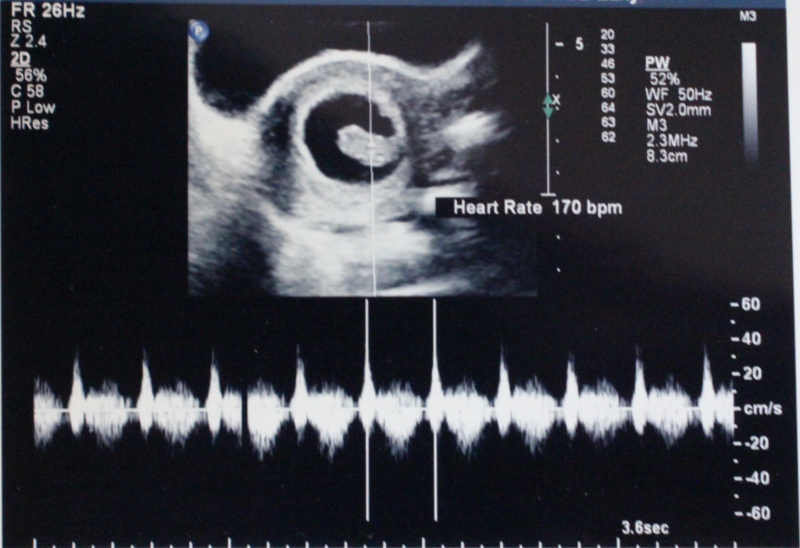 Measuring 8w5d at 2cm long, with heartbeat measurement of 170bpm, at the first “dating” ultrasound. We have a little bit of a break before we see an OBGYN or midwife again. Our next doctor’s appointment is set for March 1 and should be similar to our first appointment as far as discussing symptoms and some blood draws for tests. Baby should be measuring in at 11 weeks and 3 days at that appointment. Between now and our future appointment, I’ll be blogging about family goings-on and any little updates with baby. Stay tuned to know more about Waterbear and the journey to their arrival! As always, feel free to comment or ask questions below. 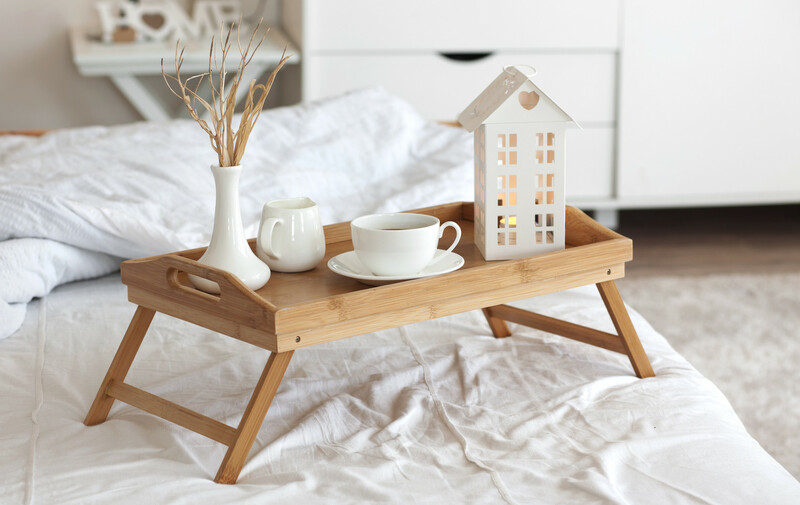 Firstly I wish to say great blog! I needed a quick question which I’d want to ask should you not mind. just may seem like the initial 10 to 15 minutes are generally lost just figuring out where to start.